Market, State and Society demonstrates the crucial role of differing configurations of domestic actors, interests and institutions in mediating the effects of globalization on welfare regimes, labor politics, and popular contestation. William C. Smith received currently teaches Latin American politics at the University of Miami. Smith received his Ph.D. in political science from Stanford University. He is the author of Authoritarianism and the Crisis of the Argentine Political Economy (Stanford University Press, 1991) and the editor of numerous volumes on democracy, market-oriented restructuring, and contentious politics in Latin America, including Latin American Democratic Transformations (Wiley-Blackwell, 2009). His articles have been appeared in numerous journals, including: Studies in Comparative International Development, Revista Mexicana de Sociología, Dados, Desarrollo Económico, Political Power and Social Theory, Contexto Internacional, Fuerzas Armadas y Sociedad, Nueva Sociedad, América Latina Hoy, and the Latin American Research Review. Smith is the editor of Latin American Politics and Society. Laura Gómez-Mera currently teaches International Political Economy at the University of Miami. Gómez-Mera received her D.Phil in Politics and International Relations at Oxford University. Her articles have been published in a number of journals, including Review of International Political Economy, Latin American Politics and Society, Journal of Latin American Studies and Journal of International Relations and Development. Gómez-Mera is a member of the editorial board of Latin American Politics and Society. 1. 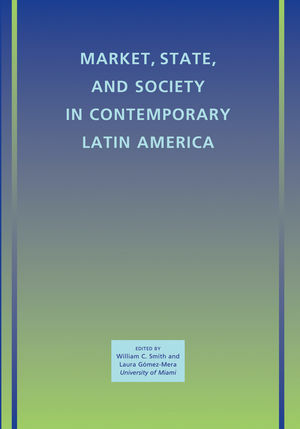 State, Market and Society in Contemporary Latin American Political Economy (William C. Smith and Laura Gómez-Mera). 2. Revolution or Contribution? Rational Choice Approaches in the Study of Latin American Politics (Evelyne Huber and Michelle Dion). 3. Toward a Critique of Latin American Neostructuralism (Fernando Ignacio Leiva). 4. 'We Have A Consensus': Explaining Political Support for Market Reforms in Latin America (Leslie Elliot Armijo and Phillippe Faucher). 5. The World Bank and Policy Reform in Mexico and Argentina (Judith Teichman). 6. Constructing Reform Coalitions: The Politics of Compensations in Argentina's Economic Liberalization (Sebastián Etchemendy). 7. The Repoliticization of Collective Action After Neoliberalism in Peru (Moisés Arce). 8. Globalization and Pension Reform in Latin America (Sarah M. Brooks). 9. Ideas, Economic Pressures, and Pension Privatization (Raúl L. Madrid). 10. Meeting the Challenges of Industrial Restructuring: Labor Reform and Enforcement in Latin America (Mark Anner). 11. Welfare Regimes in Latin America: Capturing Constellations of Markets, Families, and Policies (Juliana Martínez Franzoni). 12. Elections and Economic Turbulence in Brazil: Candidates, Voters, and Investors (Anthony P. Spanakos and Lúcio R. Renno). 13. Institutional Weakness and the Puzzle of Argentina's Low Taxation (Marcus André Melo). 14. U.S. Power and the Politics of Economic Governance in the Americas (Nicola Phillips). 15. Networks of Trade Protest in the Americas: Toward a New Labor Internationalism? Fading Green? Environmental Politics in the Mercosur Free Trade Agreement (Kathryn Hochstetler).